All the "kids" at our Tex-mex dinner. grow up quick Arianna ! I painted this last year. I am glad that last week has passed. It ended well. The Bible Study was good. The market on Friday morning went well. They had closed downtown because they were setting up stuff for Christmas, and so I put my stand up in another place. I ended up next to an young man who was selling crystals. We had a nice time talking. 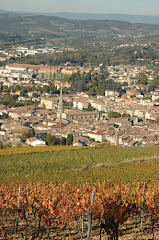 He has traveled all over and then, after two angels talked to him, he built a temple in a town near Limoux. He sells crystals and gives seminars about how to use them and the special powers that they hold. Needless to say, it was an interesting visit. Other than that, I met a former missionary that was interested in the Bible Study and also handed out a few Bible Verse Calenders as well. It was cold but worth the time. I also met someone online, who had seen my Youtube videos and wanted me to help with his translation of a song. I did what I could and got that back to him.